In 1998, we found a bridge between algebraic geometry and learning theory. Algebraic and geometric properties of neural networks were clarified and concrete results were derived. (1) S. Watanabe. Algebraic analysis for nonregular learning machines. NIPS. Vol.12, 2000, 356-362. (2) S. Watanabe, Algebraic geometrical methods for hierarchical learning machines. Neural Networks, Vol.14, No.8,pp.1049-1060, 2001. (3) K.Yamazaki, S.Watanabe. Singularities in mixture models and upper bounds of stochastic complexity. Neural Networks, Vol.16, No.7, pp.1029-1038, 2003. (4) K. Watanabe, S. Watanabe. Stochastic complexities of gaussian mixtures in variational bayesian approximation. Journal of Machine Learning Research, Vol.7, pp.625-644, 2006. If the posterior can be approximated by some normal distribution, then CV and WAIC are asymptotically equivalent to each other in the second order. Sumio Watanabe, Higher Order Equivalence of Bayes Cross Validation and WAIC , Springer Proceedings of Mathematics and Statistics, Information geometry and its applications (4), pp.47-73, 2018. Thus, minimizations of CV and WAIC are asymptotically equivalent in prior optimization. In experiments, the variance by WAIC is smaller than that by CV. Mathematical theory of deep learning was already discovered. A neural network in Bayes (mp4) . 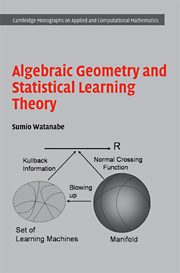 Sumio Watanabe, Algebraic geometry and statistical learning theory, Cambridge University Press, 2009. If you are a statistician or a machine learning researcher, then you should understand Vol.7 and 8 in this lecture. They are fundamental parts. WAIC(2010) is the generalized version of AIC. WBIC(2013) is the generalized version of BIC. WAIC and WBIC can be used even if the posterior distribution is far from any normal distribution. New statistical theory is established that holds even for non-regular models such as a normal mixture, a neural network, and hidden Markov models. The resolution theorem in algebraic geometry transforms the likelihood function to a new standard form in statistics. The asymptotic behavior of the log likelihood ratio function is given by the limit empirical process on algebraic variety. This theory contains regular statistical theory as a very special part. We can make generalized concepts of AIC and BIC, even if a true distribution is unrealizable by or singular for a statistical model. In fact, WAIC and WBIC are derived. It is very easy to apply them to practical applications. Both WAIC and WBIC are based on the completely new statistical theory. Neither positive definiteness of Fisher information matrix, asymptotic normality of MLE, nor Laplace approximation is necessary in our new theory. Thus, our theory holds for wide range of statistical models. Let's see the true likelihood function. Let's compare WAIC with DIC. Let's compare CV with WAIC. Let's compare PSISCV with WAIC. Let's compare CV, PSIS, with WAIC as Estimator of Generalization Error. (1) CV and WAIC had better be compared with the generalization error. CV is not always the best estimator of the generalization error. 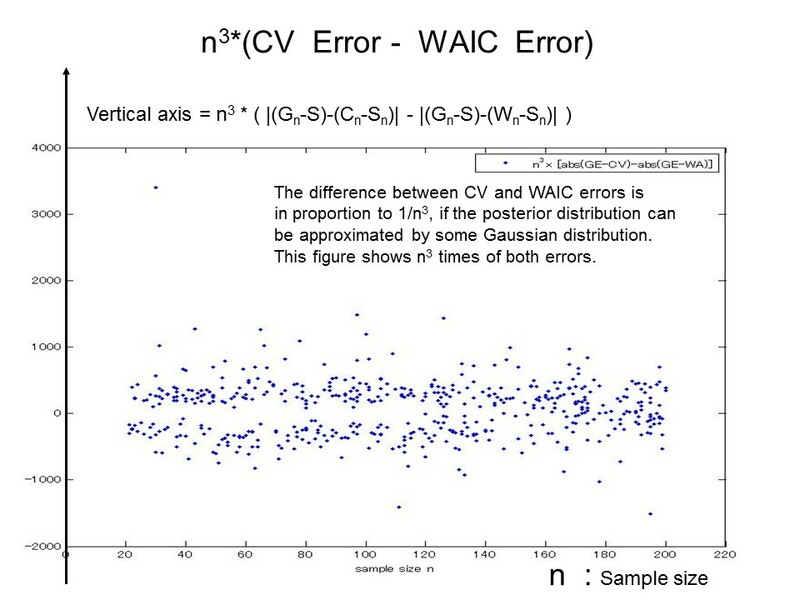 (2) WAIC is not an approximation of CV but an estimator of the generalization error. In fact, there exist cases when WAIC can estimate the generalization error, even if a sample consists of dependent variables. (3) When n is small, WAIC is also the better estimator of the generalization error than CV. The cross validation (CV), Pareto Smooting importance sampling cross validation (PSISCV), and WAIC are asymptotically equivalent uder the condition that a sample consists of independent random variables. However, the purpose of WAIC is not approximating CV but estimating the generalization error. Thus we had better compare them as estimators of the generalization error. It is easy for you to conduct the same experiment. I recommend that you had beter see the true experimtal result by your own eyes. |WAIC-GE| : absolute value of the difference between WAIC and the generalization error. |PSIS-GE| : absolute value of the difference between the Pareto smoothing importance sampling cross validation and the generalization error. WAIC is the better approximator of the generalization error than the impostance sampling cross validation. The following shows histogram of |ISCV-GE|-|WAIC-GE|. The following shows histogram of |PSIS-GE|-|WAIC-GE|. WAIC is the better approximator of the generalization error than the pareto smoothing importance sampling cross validation. The Pareto smoothing cross validation may be the better estimator of the cross validation than WAIC, however, it is not that of the generalization error. For another case (a leverage sample point is contained). where the last one is a leverale sample ponit. The following figure shows the difference of LOOCV and WAIC as estimators of the generalization loss in the case of a linear regression problem on 5 dimensional space. "Vertical axis >0" is equivalent to "WAIC is better than LOOCV". The follwing shows another experiment. 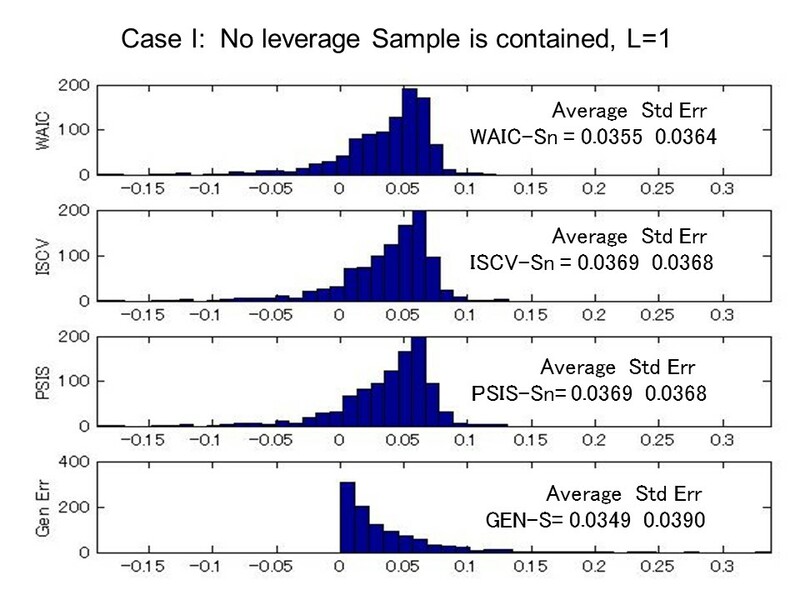 If a leverage sample point is contained, then the importance sampling cross validation and the Pareto smoothing cross validation have the larger variance than WAIC. A learning machine or a statistical model is called singular if its Fisher information matrix is singular. (A matrix A is singular if det(A)=0). Almost all learning machines which have hidden variables or hierarchical structure are singular. In singular learning machines, asymptotic normality of the maximum likelihood estimator does not hold. We are now establishing a new statistics based on algebraic geometry and algebraic analysis. The asymptotic statistical theory of regular models is being generalized onto singular statistical models. The theory is mathematically beautiful and statistically useful. Singular Learning Theory . Can we optimize hyperparameters by cross validation, WAIC, DIC, and the marginal likelihood ? Our answer is arXiv:1503.07970 .(2015/March/27). Information Geometry and its Applications IV, June 13-17, 2016, Liblice, Czech Republic. Prof. Vehtari, Prof. Gelman, and Prof. Gabry reported a new interesting research result, Paper by Vehtari, Gelman, and Gabry (arXiv). They recommend ISLOOCV using the Pareto Smoothed ISCV (PSISCV) rather than WAIC. My comments are as follows. (1) In numerical calculation of importance sampling cross validation, it is known that the integration of the importance weight 1/p(x_i|w) over the posterior distribution has a large variance. The authors propose PSISCV, in which larger 20% importance weights are replaced by the estimated Pareto distribution. (2) The purpose of ISLOOCV and WAIC is to estimate the generalization error (GE), or Kullback Leibler distance between the true and estimated distributions. In the above paper, the authors only compared PSIS-ISLOOCV and WAIC as the numerical approximators of CV. It is trivial that there may exist a better numerical approximator of CV than WAIC, because the exact CV is different from the exact WAIC. However, PSISCV and WAIC should be compared with GE from the viewpoint of bias and variance. They are random variables. Please see a comparison of PSISCV with WAIC . (3) Even if the exact CV and WAIC are obtained (without posterior sampling), CV is not always better than WAIC as the estimator of the generalization error. Please see CV and WAIC. (4) A statistical estimation is called influential observation if a leverage sample is contained in a training set. A leverage sample affects statistical estimation very strongly. Its effect may be good or bad, which depends on randomness. Thus a statistician considers whether the leverage sample should be contained or removed. On the other hand, in influential observation, CV and WAIC are different from each other, and ISLOOCV has the infinite variance. Therefore, in the practical applications, if ISLOOCV and WAIC are different, then a statistician recognizes a leverage sample is contained. I would like to recommend that comparison of ISLOOCV with WAIC is useful to find a leverage sample. (5) Theoretically speaking, WAIC is not an approximator of CV. WAIC was firsly derived by the partial integration of the generalization error with respect the empirical process. After such a mathematical theorem was found, asymptotic equivalence of CV and WAIC was proved. (6) We showed that the exact CV has the larger variance than the exact WAIC in hyperparameter evaluation. arXiv:1503.07970 . In the prior design problem, we proved the relation between Bayesian cross validation, WAIC, and the generalization error, in regular asymptotic theory. Sumio Watanabe, ``Bayesian Cross Validation and WAIC for Predictive Prior Design in Regular Asymptotic Theory", arXiv:1503.07970 ,(2015/March/27). Dr. Tokuda, Dr. Nagata, and Prof. Okada opened a new research result for RLCT in RBF network. Tokuda, Nagata, Okada, A numerical analysis of learning coefficient in radial basis function network, IPSJ Transactions on Mathematical Modeling and Its Applications. Prof. Aki Vehtari and Prof. Andrew Gelman opened a very important new research result, Aki Vehtari and Andrew Gelman, WAIC and cross-validation in Stan . Prof. M.B.Hooten and Prof. N.T.Hobbs showed a guide monograph, M.B.Hooten and Prof. N.T.Hobbs, A Guide to Bayesian Model Selection for Ecologies. This paper contains several mistakes. I would like to add several comments. (1) WAIC, a widely applicable information criterion, is a statistic which needs neither Laplace approximation nor Fisher asymptotic theory. ``Widely applicable" means that it is avaliable even when the posterior is far from any Gaussian function. On the other hand, DIC is a criterion which requires the posterior normality. WAIC's proposal and its mathematics was firstly given in S.Watanabe, Equations of states in singular statistical estimation. Neural Networks, Vol.23, No.1, 2010, pp.20-34. There is no paper before them which made the information criterion that can be used even in sigular posterior distribution. (2) In the other 2010 paper, Asymptotic equivalence of Cross-Validation and WAIC was proved, S. Watanabe, Asymptotic Equivalence of Bayes Cross Validation and Widely Applicable Information Criterion in Singular Learning Theory. Journal of Machine Learning Research. Vol.11,pp.3571-3594, 2010. (3) If AIC, DIC, or cross validation can be applicable, then WAIC is also applicable. In other words, if WAIC can not be applied to a statistical model, then no information criterion can not be applicable. (4) In the 2013 paper, WAIC was NOT studied, S. Watanabe, A Widely Applicable Bayesian Information Criterion, Vol.14, pp.867-897, 2013. In the 2013 paper, a new method, WBIC, was introduced, which enables us to compute the marginal likelihood with a quite low computational costs. WBIC can be used even when the posterior is singular. (5) WAIC needs an assumption that samples are taken from probability distribution and that the expectation value over all sample sets is statistically well-defined. If such assumption cannot be adopted, then WAIC is NOT available. In such cases, there is no information criterion that can be used. Dr. Longhai Li, Dr. Shi Qiu, Dr. Bei Zhang, and Dr. Cindy X. Feng propose integrated IS and WAIC for statistical models with latent variables, Longhai Li, Shi Qiu, Bei Zhang, Cindy X. Feng, Approximating Cross-validatory Predictive Evaluation in Bayesian Latent Variables Models with Integrated IS and WAIC, arXiv:1404.2918. The great statisticians who created DIC (deviance information criterion) published a new important article, David J. Spiegelhalter, Nicola G. Best, Bradley P. Carlin and Angelika van der Linde,``The deviance information criterion: 12 years on", Journal of the Royal Statistical Society: Series B (Statistical Methodology) April 8 2014, DOI: 10.1111/rssb.12062. All statisticians will be interested in this article. I'm very glad to build a bridge, DIC === WAIC === Cross Validation. Prof. Akimichi Takemura, Prof. Caroline Uhler, and Prof. Ruriko Yoshida organize a conference on Algebraic Statistics , July 14-17, 2014, NIMS, South Korea. Professor Miki Aoyagi published a new paper. Consideration on Singularities in Learning Theory and the Learning Coefficient. Entropy 2013, 15, 3714-3733; doi:10.3390/e15093714. Professor Mathias Drton and Professor Martyn Plummer proposed a new method to estimate BIC in singular models. A Bayesian information criterion for singular models, arXiv1309.0911 . In Drton-Plummer method, real log canonical thresholds (RCLTs) are used but MCMC processes are not. I would like to thank Professor Kenji Yamanishi and Professor Jun'ichi Takeuchi for WITMISE2013, August 26-29 . I would like to thank Professor Russell Steele for the invited session of singular statistical model selection, in Joint Statistical Meeting 2013, August 3-8 . I would like to thank Professor Mathias Drton for the special session of singular learning theory, in SIAM Applied Algebraic Geometry 2013 , SIAM Applied Algebraic Geometry 2013, August 1-4, 2013. A.Gelman, J.B.Carlin, H.S.Stern, D.B. Dunson, A.Vehtari, and D.B.Rubin, Bayesian Data Analysis, 3rd Edition, Chapman and Hall/CRC was published, which is the most popular and exellent textbook of Bayesian statistics. I would like to add comments. (Remark 1) If we want to find the true model among several candidate models, then WBIC is better than WAIC. On the other hand, if we want to estimate the generalization error, then WAIC is useful. 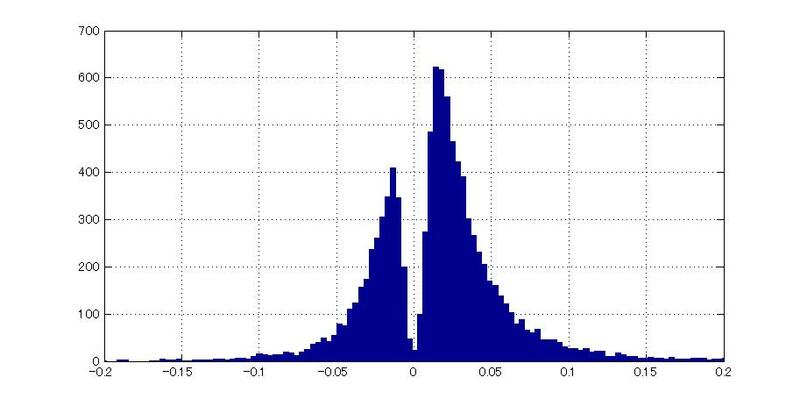 Both WAIC and WBIC can be employed under any circumstance, for example, even if the posterior distribution is far from any normal distribution. (Remark 2) From the theoretical point of view, WAIC is important because the nontrivial variance of CV can be derived from WAIC theory. Let S and Sn be respectively the average and empirical entropies of the true distribution. Also let BgL be the Bayes generalization loss of the Bayes predictive distribution. We can derive the fact that the variance of (BgL-S) is asymptotically equal to that of (WAIC-Sn), even in singular case. Therefore, by the asymptotic equivalence of WAIC and CV, the same relation is derived for cross-validation, which is not trivial. Theorem 2 in (JMLR,2010) shows such relations. Aki Vehtari and Janne Ojanen, ``A survery of Bayesian predictive methods for model assessment, selection and comparison, Statistics Surveys, Vol.6, pp.142-228, 2012. STAN is the package for obtaining Bayesian inference using the No-U-Turn sampler, a variant of Hamiltonian Monte Carlo. The method how to construct the posterior distribution is very important for Bayes statistics. JAGS is a program for analysis of Bayesian hierarchical models using Markov Chain Monte Carlo (MCMC) simulation. BUGS project is concerned with flexible software for the Bayesian analysis of complex statistical models using Markov chain Monte Carlo (MCMC) methods. Dr. Jarno Vanhatalo, Dr. Jaakko Riihimäki, Dr. Jouni Hartikainen, Dr. Pasi Jylänki, Dr. Ville Tolvanen, and Dr. Aki Vehtari in Alto University reported the project GPstuff toolbox, GPstuff: Bayesian Modeling with Gaussian Processes . The software is on Machine Learning Open Source Software . We established a widely applicable Bayesian information criterion (WBIC). It is well known that the computational cost in numerical calculation of the Bayes marginal likelihood is quite high. Its asymptotic expansion is given by the formula using the real log canonical threshold (RLCT), but we do not know the true distribution in practical applications, hence RLCT is also unknown. To overcome such difficulty, we defined WBIC and proved by an algebraic geometrical method that WBIC has the same asymptotic expansion as the Bayes marginal likelihood, even if a true distribution is singular for or unrealizable by a statistical model. By using WBIC, we can estimate both the Bayes marginal and the real log canonical threshold with a low computational cost without any information about the true distribution. A widely applicable Bayesian information criterion, arXiv:1208.6338 (2012/8/31). The revised paper was published in Journal of Machine Learning Research. A widely applicable Bayesian information criterion . (Remark 1) WAIC and WBIC are respectively generalized concepts of AIC and BIC onto singular statistical models, they are asymptotic unbiased estimators of the generalization loss and the marginal likelihood respectively. You know the difference between AIC and BIC. AIC is an asymptotically unbiased estimator of the generalization error but it does not have consistency in model selection, whereas BIC is not an asymptotically unbiased estimator of the generalization error, but it has consistency in model selection. The difference of WAIC and WBIC is conjectured to be same as that of AIC and BIC. In Bayes estimation, The generalization errors of singular models are smaller than those of regular models, even if a statistical model is redundant compared to a true distribution. Therefore WAICs are also smaller. If one wants to select the true model, WBIC may be better than WAIC under the condition that the true model is contained in candidate models. (Remark 2) If you are a Bayes statistician, you may have a software for MCMC. It is very easy to calculate WBIC by your software with a low computational cost. In fact, firstly, the inverse temperature is set as 1/log n, secondly one MCMC procedure is conducted. That's all. Let's try WBIC . (Remark 3) If you are a mathematician, please enjoy the fact that there exists a random variable which converges to the real log canonical threshold in probability, even if we do not know a true distribution. A birational invariant has naturalness in both mathematics and statistics. It is well known in algebraic geometry that the log canonical threshold indicates the relative singular complexity of a pair of algebraic varieties. In statistics, it shows the relative statistical complexity of a pair of the set of true parameters and and that of all parameters. Recently, tensor networks, graphical models, and deep learning are being well studied. Professor Jason Morton gave a very good presentation, J. Morton, An algebraic perspective on deep learning . As he pointed out, almost all learning machines that have deep layers have a lot of singularities, hence statistical evaluation of them needs singular learning theory. The typical singular learning machine is a layered neural network. I would like to claim that both their generalization performance and Bayes free energy can be estimated by using WAIC and WBIC. Recently, the very important advances in algebraic statistics and algebraic machine learning are reported. New mathematics and statistics will be created from these studies. Franz J. Király, Paul von Bünau, Frank C. Meinecke, Duncan A.J. Blythe, Klaus-Robert Müller. Algebraic Geometric Comparison of Probability Distributions. Journal of Machine Learning Research, Vol.13,pp.855-903, 2012. Piotr Zwiernik, An Asymptotic Behaviour of the Marginal Likelihood for General Markov Models. Journal of Machine Learning Research, Vol.12, pp.3283-3310, 2011. Shaowei Lin, Algebraic Methods for Evaluating Integrals in Bayesian Statistics. Ph.D. dissertation, University of California, Berkeley, May 2011. Mathies Drton, Reduced Rank Regression, Workshop on Singular Learning Theory, American Institute of Mathematics. 2011, December 12-16. Miki Aoyagi, Stochastic Complexity and Generalization Error of a Restricted Boltzmann Machine in Bayesian Estimation. Journal of Machine Learning Research, Vol.11, pp.1243-1272, 2010. The workshop ``Algebraic geometry and model selection" was successfully held in AIM. I would like to thank Prof. Russell Steele, Prof. Bernd Sturmfels, and all participants of this workshop. Also I would like to thank American Institute of Mathematics. K. Yamada and I introduced a new statistical concept ``Quasi-Regular Cases", which are not regular cases but have the same properties as the regular cases. For quasi-regular cases, we can derive both the real log canonical threshold and the singular fluctuation, hence they are useful to study singular statistical estimation. arXiv:1111.1832 . (2011/Nov/10). E. Riegler, V. Morgenshtern, G. Durisi, S. Lin, B. Sturmfels, and H. Bolcskei found a new lower bound on the noncoherent capacity pre-log of SIMO channel, by algebraic geometrical method. http://arxiv.org/abs/1105.6009 . (2011/June/02). Professor I. Ojima and K. Okamura in Research Institute for Mathematical Sciences (RIMS) propose large deviation strategy in mathematical quantum estimation theory. arxiv:1101.3690v1 (2011/Jan/20). We proved that Bayes cross validation (BCV) is asymptotically equivalent to WAIC even for singular models. Also we showed that the sum of BCV and Bayes generalization error is asymptotically equal to 2*lambda/n as a random variable, where lambda is the log canonical threshold and n is the number of training samples. Note that the expectation value of BCV is equal to that of the generalization error by the definition. However, we can not know the variance of BCV. 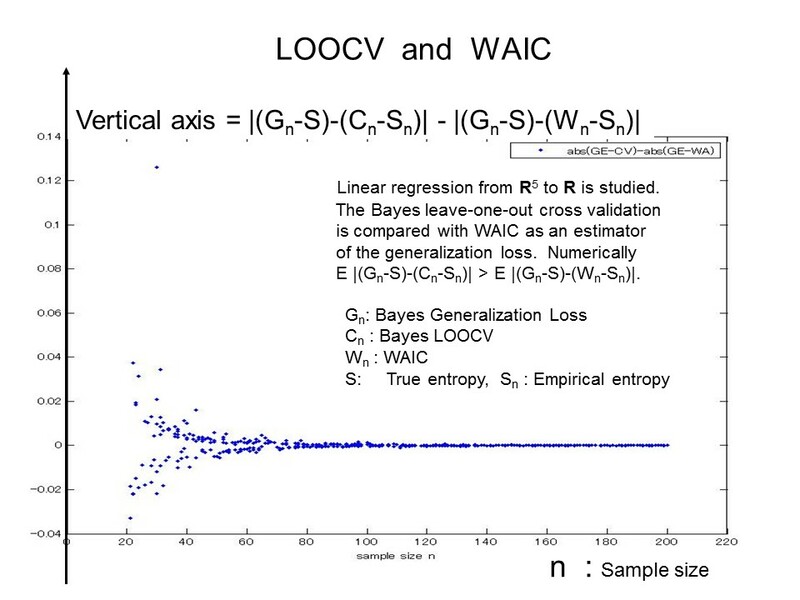 Since the variance of WAIC is equal to that of the generalization error, it is aslo proved that the variance of BCV is equal to that of the generalization error. It should be emphasized that the variance of WAIC can not be derived without algebraic geometry. arXiv:1004.2316 , (2010/April/15). This paper was improved. The theoretical and experimental comparison of DIC, BCV, and WAIC was included. In singular statistical models, DIC is different from BCV and WAIC, even asymptotically. (2010/Oct/15). This paper was published. 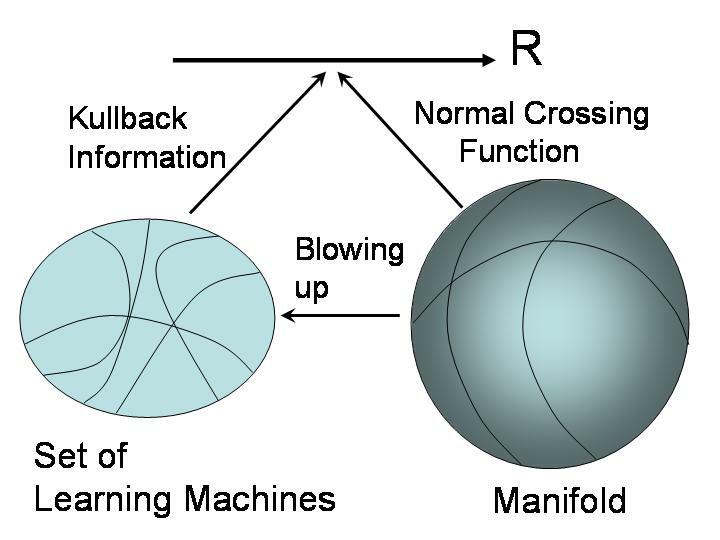 Journal of Machine Learning Research, Vol.11, (DEC), pp.3571-3594,2010. (2010/DEC/06). Dr. Shaowei Lin in UC Berkeley and Dr. Piotr Zwiernik in Warwick Univ. found new research results in algebraic geometry, algebraic statistics, and symbolic computation. S. Lin's paper and P. Zweirnik's paper , new paper. (2010/March/30), (2010/Dec/07). International Conference on Mathematical Quantum Field Theory and Renormalization Theory, Chairs: Professor Takashi Hara, Professor Taku Matsui, and Professor Fumio Hiroshima. , A Singular Limit Theorem in Statistical Learning Theory (Kyushu, Japan, 26-29/Nov/2009). The fifth Symposium on Singularities (IRMA Institute, France, 24-28/Aug/2009). The PDF file . Professor Sturmfels visited Japan by Professor Takemura's invitation. (2009/July/6-10). Equations of states hold even if the true distribution is not contained in a parametric model. Sumio Watanabe, Equations of States in Statistical Learning for a Nonparametrizable and Regular Case , arXiv:0906.0211 (1/June/2009). This paper will appear in IEICE Transactions, whose title is ``Equations of states in statistical learning for an unrealizable and regular case." This paper was published, whose title was ``Equations of states in statistical learning for an unrealizable and regular case." IEICE Transactions, Vol.E93-A, No.3, pp.617-626, 2010. AIC in a regression problem is generalized so that it can be used in singular statistical models. Sumio Watanabe, A limit theorem in singular regression problem, arXiv:0901.2376v1 (16/Jan/2009). This paper was accepted for publication in Advanced Studies of Pure Mathematics , Also see here (9/Aug/2009). Probabilistic Approach to Geometry (July 28 - August 8 /2008). We proved that exchange probability in Monte Carlo is determined by the real log canonical threshold. Kenji Nagata, Sumio Watanabe, ``Asymptotic Behavior of Exchange Ratio in Exchange Monte Carlo Method,'' International Journal of Neural Networks, Vol. 21, No. 7, pp. 980-988, 2008. In World Congress on Computational Intelligence, the following paper was published, S.Watanabe, "A formula of equations of states in statistical estimation," Proc. of WCCI, Honkong, 2008, June, 1-6. (Jun/2008). The widely applicable information criterion (WAIC) was discovered. We found the Equations of states in singular statistical estimation , by which we can predict both Bayes and Gibbs generalization errors from Bayes and Gibbs training errors without any knowledge of the true distribution (5/Dec/2007). The most important fact is that these equations hold even if the true distribution is singular for a statistical model. This paper was submitted (5/Dec/2007), and published in International Journal of Neural Networks, Vol.23, No.1, pp.20-34, 2010. The review process was one year and eight months. Misprint. In table.1, E[WAIC1] shows the expectation value of E[WAIC-Sn]. Niigata Workshop on Complex Geometry and Singularities (26/July/2007). Professor Morihiko Saito in Research Institute for Mathematical Sciences in Kyoto University proved the relation between the real log canonical threshold and roots of b-function. On real log canonical thresholds . (17/July/2007). S. Watanabe, ``Almost all learning machines are singular." invited paper in IEEE FOCI 2007 (2007/4/5). In The Clay Mathematics Institute, a workshop of Algebraic Statistics and Computational Biology (2005/Nov/11-15). M.Aoyagi, S. Watanabe, "Stochastic complexities of reduced rank regression in Bayesian estimation," PDF file, Neural Networks, Vol.18,No.7,pp.924-933,2005. In 2003, we clarified the effect of singularities in a normal mixture. K.Yamazaki, S.Watanabe,``Singularities in mixture models and upper bounds of stochastic complexity." International Journal of Neural Networks, Vol.16, No.7, pp.1029-1038,2003. AMS Meeting : Biological Computation and Learning in Intelligent Systems AMS 2002 Fall Central Section Meeting was held in Madison, Wisconsin, October 12-13, 2002 University of Wisconsin. (2002). Frontier of Non-Commutative Analysis and Mathematical Quantum Theory (2002). We discovered that Bayes marginal is given by algebraic analysis and algebraic geometry. Sumio Watanabe,"Algebraic analysis for nonidentifiable learning machines", Neural Computation, Vol.13, No.4, pp.899-933, 2001. In 2001, we proved that the Bayesian stochastic complexity using Jeffreys' prior is asymptotically equal to that of regular statistical model. S.Watanabe,"Algebraic information geometry for learning machines with singularities", Advances in Neural Information Processing Systems, (Denver, USA), pp.329-336. 2001. S.Watanabe,"Algebraic analysis for non-regular learning machines," Advances in Neural Information Processing Systems, Vol.12, 2000, 356-362. In 1999, we reported the algebraic analysis of learning theory. S.Watanabe,"Algebraic analysis for singular statistical estimation," Lecture Notes in Computer Sciences, Vol.1720, pp.39-50, 1999. In 1995, we pointed out the Bayesian posterior distribution is singular. S.Watanabe, ``A generalized Bayesian framework for neural networks with singular Fisher information matrices," Proc. of International Symposium on Nonlinear Theory and Its applications, (Las Vegas), pp.207-210, 1995. S.Watanabe, �gAn optimization method of artificial neural networks based on the modified information criterion,�h Advances in Neural Information Processing Systems, Morgan Kaufmann, New York, Vol.6, pp.293-300, 1994. Professor Huzihiro Araki (Mathematical Science) Professor Araki, a Poincare medalist, is famous for contribution to operator algebra and mathematical physics. Probability Theory, Mathematical Statistics, and Learning Theory. (1) To establish mathematical foundation of statistical learning. (2) To construct a new research field between mathematics and neuroscience. (1) S. Watanabe, "Neural Networks for Robotic Control - Theory and Applications," Prentice Hall, 1996. (2) S.Watanabe and K.Fukumizu, "Algorithms and Architectures," Academic Press, 1998. (3) S.Watanabe, Algebraic Geometry and Statistical Learning Theory UK, US (2009/August). If you are a mathematician or a statistician, you can understand the importance of the following formulas. From the mathematical point of view, these formula clarified the relation between algebraic geometry and statistics. From the statistical point of view, these are generalized BIC and AIC for singular statistical models. These two main formulas are mathematically very beautiful and statistically very useful. where E[ ] is the expectation value over all sets of random samles. Also we can algorithmically calculate A and B by applying Hironaka's resolution of singularities to the Kullback information, and obtain that A is not larger than D/2, and that B is not larger than D, where D is the number of parameters. The constants A and B are determined by the algebraic geometrical structure of the learning machine. If a model p(x|w) is regular, then A=D/2 and B=1, hence this formula is the generalized version of BIC and MDL. Let Bg, Bt, Gg, Gt be Bayes generalization error, Bayes training error, Gibbs generalization error, and Gibbs training error, respectively. Then the following formulas hold for arbitrary true distribution, arbitrary parametric model, arbitrary a priori distribution, and arbitrary singularities. where b is the inverse temperature of the a posteriori distribution. By using these formulas, we can estimate Bayes and Gibbs generalization errors from Bayes and Gibbs training errors. If a model is regular then E[Gt-Bt]=D/2, where d is the dimension of the parameter space. Hence these formulas contain AIC as a very special case. S. Watanabe, ``Algebraic analysis for nonidentifiable learning machines," Neural Computation, Vol.13, No.4, pp.899-933, 2001. S. Watanabe, ``A formula of equations of states in singular learning machines," Proceedings of WCCI, Hongkong, 2008. We would like to claim that these results were firstly discovered, which were unknown even in statistics, information theory, and learning theory. Also we expect that these results mathematically clarify the essential difference between neural networks and regular statistical models. In other words, the reason why neural networks in Bayesian estimation are more useful than regular statistical models is firstly proven mathematically. Algebraic geometry and algebraic analysis play an important role in the theory of complicated learning machines. For more detail, see Singular learning theory . which can be analytically continued to the entire complex plane. You must know the Riemann's Hypothesis that will clarify the distribution of prime numbers. which can be analytically continued to the entire complex plane. Professor Gel'fand conjectured in 1954 that this function is meromorphic, and both Professor Bernstein and Professor Atiyah clarified this fact. In Atiyah's method, Hironaka's resolution of singularities plays a central role. This function clarifies the Bayesian Statistics as I have shown in the foregoing sections. where X1,X2,...,Xn are training samples taken from the true distribution and E shows the expectation value overall sets of training samples. Z(X1,X2,...,Xn) is the partition function or the evidence of the learning. It is strongly expected that this function plays an important role in clarifying the mathematical structure of the Replica method in mathematical physics. Sumio Watanabe was born in Japan, March 31, 1959. He received the B.S. degree in Physics from University of Tokyo, Japan, the M.S. degree in Mathematics from Research Institute for Mathematical Sciences (RIMS), Kyoto University, Japan, and the Ph. D. degree in applied electronics in 1993 from Tokyo Institute of Technology, Japan. Dr. Watanabe is currently a professor at Mathematical and Computing Science in Tokyo Institute of Technology. His research interest includes probability theory, applied algebraic geometry, and Bayesian statistics. He firstly discovered algebraic geometrical structure in statistical learning theory, and proposed that the standard form of the likelihood function can be derived from resolution of singularities, on which we can establish a new mathematical statistics. He found WAIC and WBIC which can be used in both regular and singular statistical model evaluation.